Perkins Pacific is excited to offer our industrial customers a new engine that is a versatile engine packed with advanced technologies. The Perkins 1700 series, which is gaining traction in the North America market, gives users entry into a new power bracket. The star in this line is the 1706 model, which features a 9.3-liter turbocharged and aftercooled engine with direct injection and electronic control system. The 335hp to 456hp power range in this model is particularly engineered for hard-working applications like machines used in the construction industry. The 1706 model engine lets you extend your use across a range of applications. It also lets you select a smaller engine where you might have previously used a larger unit. This compact design gives you more space for installation and operator usability, but also reduces your running costs. The reduced engine size produces lower heat rejection, meaning you’ll need a smaller cooling pack. The on-engine aftertreatment mount will also lower your installation costs. The technological advances that went into designing the 1700 series engines will keep your machines operational in the toughest conditions, ensuring that you’ll see optimal productivity. The 1700 series has been fully validated for the toughest machines. Perkins is renowned for its history of engineering and manufacturing reliable and durable engines built in world-class facilities. 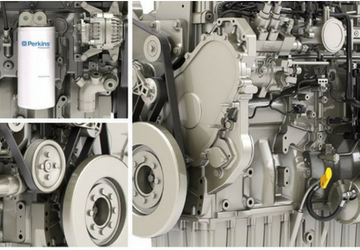 Each engine line is created specifically to withstand the demands of a broad range of applications. For the end user, Perkins engines are designed to give them a lower cost of installation and reduced integration costs. The features are meant to minimize service costs and lower fluid consumption levels, which results in a lifetime of low cost of operation. More than 50,000 engines have been built on the core that is used in the 1700 series. That same core has more than 80 million hours of validation. The result is an engine that more than passes the test for durability and functionality. So far, it’s successfully been introduced into more than 400 application types. We back up the Perkins 1700 engine line with decades of experience in servicing and maintaining Perkins engines. Let us design your Perkins 1700 engine to power your equipment and give your fleet a machine that is reliable, powerful and cost efficient.